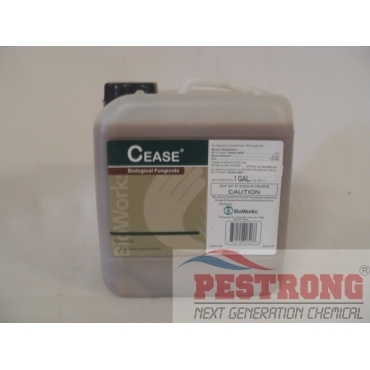 Where to Buy Cease Biological Fungicide, Cease Foliar Biological Fungicide - 1 Gal - $69.95 for Sale with Fast Free Shipping! Cease Foliar Biological Fungicide - 1 Gal is a broad spectrum, preventative product for the control or suppression of many important plant diseases. Apply Cease as a foliar spray alone, in alternating spray programs or in tank mixes with other registered crop protection products like milstop, etc. MilStop Broad Spectrum Foliar Fungicide - 5.. Proven effectiveness in controlling a wide array of both fungal and bacterial pathogens, while providing outstanding plant and environmental safety. Based on a naturally occurring, patented strain of Bacillus subtilis (strain QST 713), Cease can be used as a foliar spray and soil drench on ornamentals, trees, shrubs, flowering plants and greenhouse crops and vegetables grown under cover. It is a broad spectrum biofungicide targeting common fungal and bacterial diseases such as Botrytis, Pseudomonas, Xanthomonas, Erwinia, Powdery Mildew, Leaf Spot and Speck, Anthracnose and Rust. • Excellent safety – only a 4-hour REI, and can be sprayed up to and on the day of harvest! This is my second time ordering with pestrong and they have been a great help on my order. Great use for on my trees and vegetables. Read the label for measurements, as long as you do what it says, you'll be good! Amazingly works and Im really happy with it. and lowest price .... best !